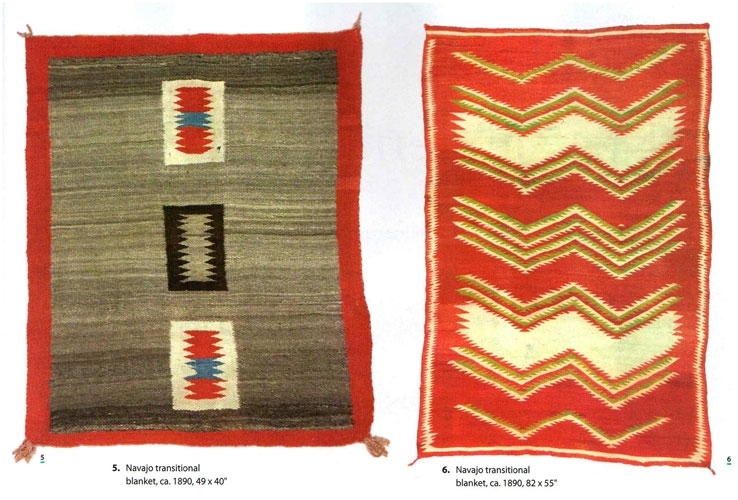 Transitional weavings, circa 1885 to 1910, represent an underappreciated class of Navajo textiles often overlooked as being made during a less important time of Navajo weaving. Until recently, what has not been recognized is the incredible artistic exploration that occurred during this time forced by economic pressures on Navajo weavers to stop making blankets for wear and shift to producing ﬂoor rugs. 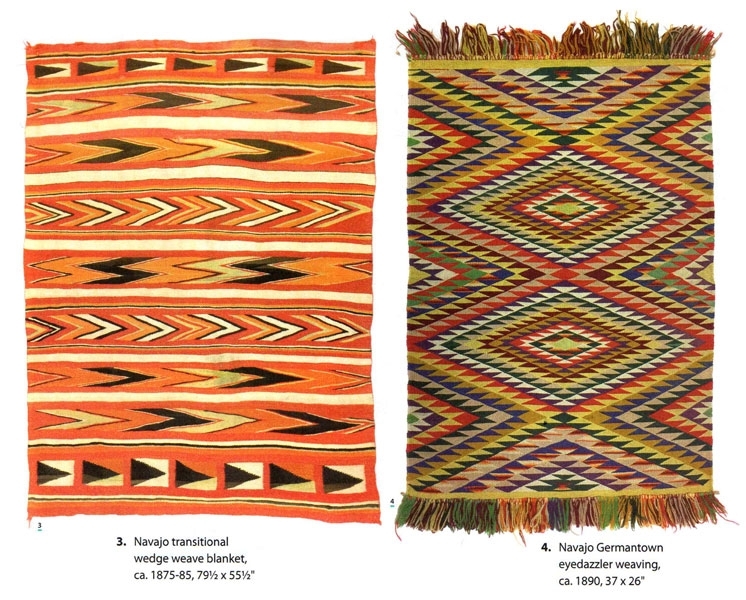 This snippet in history allowed weavers greater freedom to explore new compositions and colors they never imagined - a significant change for Navajo artistic expression. The story of how the Navajo transitioned to this unique artistic exploration begins in the 1860s. The Navajos, who had been weaving designs for generations, were defined by the style of the serapes and chief’s blankets they created. These weavings used simple stripes, rectangles, squares, triangles and chevrons for their main focal designs. While the weavings were exquisitely woven and designed, the motifs were often similar in composition. In 1864, the Navajo were rounded up by Kit Carson, at the behest of Gen. William Tecumseh Sherman, to help solve “the Indian problem." Destroying the Navajos’ hogans, sheep and orchards, the Diné, as they refer to themselves, were starved into submission. After surrendering to the United States Calvary in March of 1864, groups of Navajos were forced to march 300 miles to Bosque Redondo. Eight thousand Navajos, between 1864 and 1868, were held captive. The failed prison enculturation in eastern New Mexico finally ended, and the Navajo were released to return to Dinétah (their traditional Navajo homeland). As 3 part of the release agreement, the government added stipulations mandating Navajo children to attend Anglo boarding schools for indoctrination into the so-called American culture, required the Navajo to stay on their reservation lands in New Mexico and Arizona, and demanded there would be no raiding on surrounding and towns. Trading posts popped up around the newly formed reservations, including one run by John Lorenzo Hubbell in 1878, and these posts changed the way the Navajo looked at textile production. The traders at the various posts encouraged the weavers to stop weaving blankets and start making rugs. This change did not occur overnight but was a gradual process over many decades. The Navajo weavers responded to the economic stimulus the trading post owners encouraged. Some of the trading posts started to pay weavers by the weight of the weaving instead of the quality or design of the textile. Many weavings produced during this time frame were loosely woven to increase weight and hence value. These heavier blankets were called “pound blankets.” The traders figured out very quickly that paying for weavings in this manner decreased blanket quality eventually causing them to abandon this practice. The 1890s saw great change in the type of blanket produced. The price of raw wool plummeted in 1893 during the worldwide depression lasting four years. This added pressure on trading posts to offer a variety of weavings besides blankets to keep revenues up. The development of eyedazzler designs woven with commercial yarn, known as Germantown blankets, were named for the Pennsylvanian mills that manufactured the four—ply yarn. These tightly woven weavings, which often used cotton warp, did not hold up well on the floor and soon lost favor as floor rugs. Germantowns have always had collectability as wall art, even if it was a short production of around 15 years, with most made in the 1890s time frame. The 1960s New York Op Art artists gravitated to these “eyedazzler” weavings for their collections; this brought recognition to these specialized types of transitional blankets. In December 2017, an eyedazzler designed Germantown blanket fetched $50,000 at auction. Usually, an excellent GT (a term coined in the trade) can be found for under $10,000, smaller pieces around $2,500 or less, and samplers bringing as little as a few hundred dollars. Another unusual blanket produced from circa 1870 to 1910 is the wedge weave; the majority of these were made in the 1880 to 1890s. They use an eccentric weave creating a scalloped design at the selvage and zigzag motifs in the interior. The unusual, pulled-warp technique did not hold up well structurally and never became a mainstay in blanket production. Collectors look for these rare pieces woven during the transitional period. This experimental wedge weave design has been reproduced recently by 22-year-old contemporary Navajo weaver Kevin Aspaas, and won first place and Best of Category at the GaIlup—Tribal Indian Ceremonial. Many of the textiles woven during the transitional period are true blankets made for trade and self-use and are often referred to as Diyugi blankets by collectors. These weavings characterized by a loose weave and repetitive patterns of design or stripes—besides natural whites and browns—often incorporate red, orange and blue colors using aniline dyes. Occasionally indigo blue appears in transitional pieces from 1880; the color indigo however is most often found in 1870 and earlier weavings. Indigo dyed pieces do not fade, and an excellent gross diagnostic test to determine the origin of the dye is to spread the yarn fiber apart and look for any color change or fading in the center compared to the outside yarn. If there is any color change or fading, then this is not indigo and helps to date the textile as probably being later than 1880. The wool composition in transitional weavings is a handspun soft churro yarn whose long staple gives the pieces a soft pleasing texture to touch. If the textile feels like what you would expect from a blanket when rubbed against your skin it probably is just that- a blanket. The Germantown commercially made wool, produced in the late 19”‘ century, has a coarse feel and is a plied, even yarn, not handspun. Transitional blankets are still available, though quickly drying up in the secondary market, as original families that collected the pieces pass away and the textiles are sold. They are still affordable and often can be found for $2,500 or less. Examples with small amounts of raveled yarn, indigo or tight weft count can bring closer to $10,000 for a good example. Some of the most exciting weavings are transitional blankets incorporating simple design elements such as boxes, triangles or multi-sided polygons. The weavers who were being encouraged to produce rugs instead of blankets were allowed the artistic freedom of exploration. With little or no guidelines as to what constitutes a rug, other than a border around the edge, creativity gave way to unique designs that appealed to the weaver’s sense of what was beautiful. These weavings do not fit into any classification other than to call them transitional blankets with a modern aesthetic. Homage to the Square, a recent book on this very subject, displays examples of unique weavings from this transitional period. Transitional blankets are undervalued for what they truly represent; wearing blankets made by a culture prized for their weaving abilities. 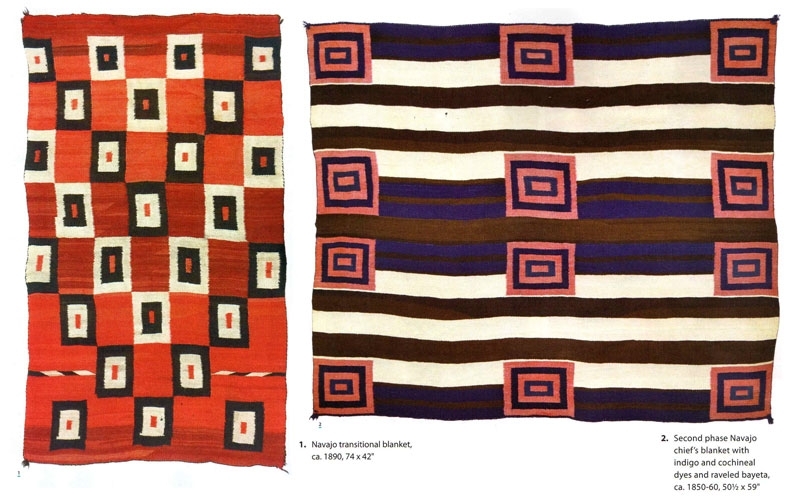 First phase Navajo blankets made 50 years earlier can bring a million dollars for a great example and undoubtedly some of these weavers, or their children, also produced transitional blankets. Despite being influenced by different economic pressures and changing tastes, the artistry of the transitional blanket comes from the same brilliant creative process the early Navajo used to create rare wearing blankets.